Description: William C. (Bill) Gowacki, "Husband-Father-Veteran," offers his award to other webmasters "Just Because" "[he] truly believe[s] [they]'ve earned it no matter what everyone else says to [them]." Citation: "Your web site is GREAT." Description: Corporal T.E. 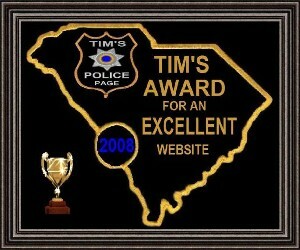 Price, a South Carolina law enforcement professional and webmaster of Tim's Police Page, presents his award "to sites that are free from Hate and Adult content." Sites are evaluated on page layout, originality, download speed, and ease of navigation. Citation: "Great site! Really love it." Description: HindSight Fishing Charters, a Canadian sport fishing company located in Sooke, British Columbia on Vancouver Island, recognizes the work of other webmasters with their award. Sites are evaluated on concept, design, layout, content, and navigation. Citation: "After carefully reviewing your site, we would like to honor you with HindSight Fishing Charters' World Class Website Award for surpassing our criteria of excellence in concept, design, layout, rich content and easy navigation. ... We have added your site to our awardees database. ... We acknowledge the effort you have put into your website; the time, hours and countless obstacles. Display your award with pride! Congratulations on producing a site of excellence." Description: San Diego Plastics, Inc. recognizes other webmasters with the Blue Jay Web Award because "only the best get the bird." Citation: "Due to the tremendous increase in the number of requests for this award we are no longer able to review web sites for the Blue Jay Web Award. Unfortunately, award winners can no longer be listed here. You are invited to take and use the Blue Jay Web Award for yourself." Description: The Webuilders Group, a British Internet company, recognizes the work of other webmasters with their award. Sites are evaluated on content, functionality, graphics, safety, navigation, and usefulness. Citation: "Your website East Forsyth Senior High School Class of 1979 ranking is : 6 out of a possible Maximum 10 points. ... Congratulations. ... The Webuilders TS Awards is pleased to announce your site has been reviewed and you have won our Silver Award. ... We spend a lot of time reviewing sites and not all make the grade. You have done a great job, keep up the good work!" Description: The American Indian Health Council, "a group of American Indians dedicated to providing health information, referral, and outreach services to the American Indian community," offers its awards "to reward all those webmasters for fostering a better understanding of American Indians, indigenous peoples all over the world and/or good web design, whether they, themselves, are American Indian or not." Sites are evaluated on design, layout, graphics, and content. Congratulations on winning AIHC's Gold Award. ... Again, my heartiest congratulations! Executive Director/Webmistress, American Indian Health Council"
Description: Mearnswood Media, a Scottish web design and hosting company, offers its award "to give official recognition and acknowledgement for the hard work and dedication that [webmasters] put into constructing their web sites using their own brand of style, creativity, and content." Sites are evaluated on content, design, and HTML coding. Citation: "Congratulations! Your Web site has been selected to win the Mearnswood Media Excellence in Design Award. ... I have chosen your site to be a worthy of our Excellence in Design Award. ... Again, Congratulations from the team at Mearnswood Media and keep up the good work!"